Filter your data in spreadsheets: We made it easier to analyze and view your data with the addition of filtering in Google spreadsheets. Applying a filter to a set of data can help you quickly narrow down the data set to find the data you need. 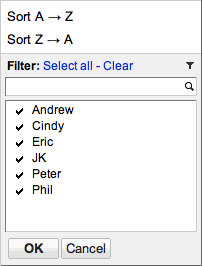 By selecting a data set, you can filter and sort amongst many rows at once. 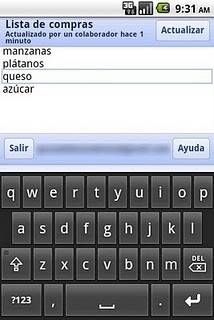 Mobile editing in 45 languages: Last year, we launched mobile editing in English in Google documents. You can now edit your documents on the go in 45 languages on Android with Froyo (version 2.2) and on iOS devices (version 3.0+) including the iPad. 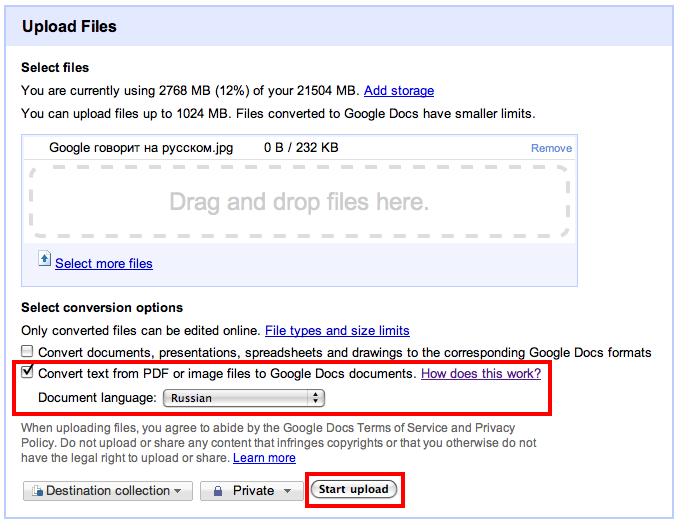 Optical Character Recognition (OCR) in 34 languages: Last June, we introduced the ability to upload documents into Google Docs using Optical Character Recognition (OCR). We’ve now added support for 29 additional character sets, including those used in most European languages, Russian, Chinese Simplified and some other Asian languages. See the upload page for the full list. Multiple chart ranges and hidden sheets in Spreadsheets: We added the ability to chart multiple ranges and hide sheets in Google spreadsheets. In charts, you can now add extra ranges by clicking on “Select ranges...” and “add another range.” You can also manually add new ranges separated by commas. In addition, we introduced the ability to hide your sheets. 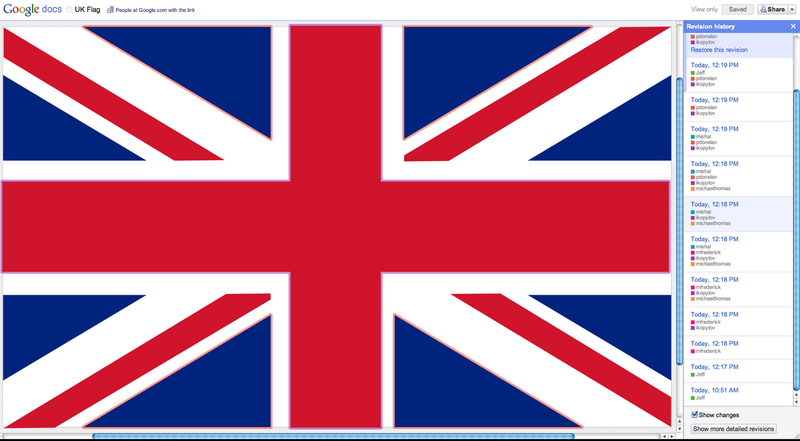 You can now click on a sheet tab and select “hide sheet” to remove a sheet from view. Revisions, presence, and format painter in Drawings: We’re making it easier to work together in drawings. First, we’ve added presence highlights around shapes so you can keep track of which object each person is editing. Second, we added revision history which lets you see who made which change as well as go back to previous versions. Third, the new format painter lets you choose a source shape, press the format painter icon to copy its formatting, and then click on another shape to apply that formatting to the destination shape. Google Cloud Connect for Microsoft Office: Google Cloud Connect is now available in 39 languages. We’ve also added the ability to hide the toolbar. Hidden gridlines in Google spreadsheets: Under the View menu, you can Hide gridlines for each sheet, leaving only the borders that have been put there. Quick starring and improved sharing invitations: Now you can star documents while editing them. Once a doc is starred, you’ll be able to find the doc by clicking on the starred link in your document list. We’ve also updated document sharing so that when you share a doc with others, all new collaborators are now included on the email. Cloud printing on the go: now you can print from your smartphone with Google Cloud Print for mobile documents and Gmail for mobile. Just open a document in Google Docs or an email in Gmail in your mobile browser and choose “Print” from the dropdown menu in the top right corner. To get started, you’ll need to connect your printer to Google Cloud Print. As with all updates in Google Docs, users get access to new features each time they open their browsers, and improvements roll out to customers with no need for administrators to manage patches or install software. Stay tuned for more updates to Google Docs. Good news. I've just translated in french and I would like to know if you agree I publish it on my blog. An informative and interesting site. Keep it up.